Degradation-related issues are among the main limitations to make solid oxide electrolysis cells (SOEC) meet performance targets economically viable for long-term operation. 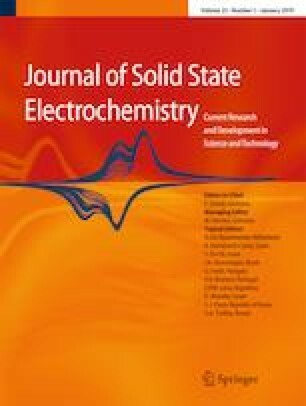 In this study, the considered cell presents a premature degradation during electrolysis operation observed after sealing the cell holder and the support pieces providing and releasing H2 electrode gas. This premature degradation is characterized by unusual polarization curve slopes, and appearance of a new impedance contribution at the lowest frequencies of the impedance diagrams recorded. To the best of our knowledge, this new contribution has never been reported for SOECs. Post-mortem analysis of the cell by scanning electron microscopy (SEM)/energy dispersive X-ray (EDX) shows the presence of Si, Al, Na, K, and Ca at the H2 electrode interface (surface and first dozens microns in the volume) and at the Ni-yttria-stabilized zirconia (YSZ)/YSZ interface, contrary to similar cells tested before sealing the pieces. This degradation is related to Si deposition, notably at the Ni/YSZ/H2O triple phase boundaries. Concomitantly, the new contribution observed, leading to a beneficial effect on the cell functioning, is assimilated to a “reactivation” contribution. This reactivation contribution is associated with an H2O adsorption phenomenon and characterized by a relaxation frequency of [1–10 mHz] and a capacitance of ~ 100 F cm−2. The evolution with time of the resistive and capacitive contributions is consistent with the interpretation of the premature cell degradation. A mechanism explaining the cell behavior after this premature degradation is proposed. The online version of this article ( https://doi.org/10.1007/s10008-018-4116-7) contains supplementary material, which is available to authorized users. This work is supported by the French Research National Agency (ANR) through Hydrogène et piles à combustible program (project FIDELHYO n°ANR-09-HPAC-005).